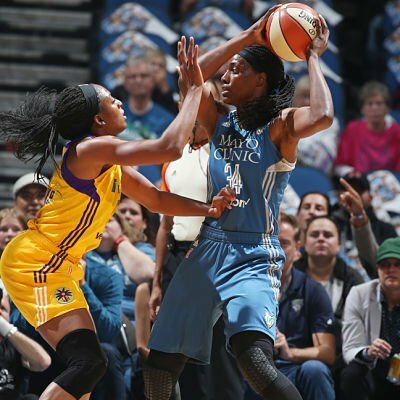 Minneapolis, Minn. – The Minnesota Lynx evened their Finals series with the Los Angeles Sparks Tuesday in a dominating 79-60 win. Maya Moore led the way for the Lynx with 21 points and 12 rebounds, and Sylvia Fowles also added a double-double, with 13 points and 10 rebounds. 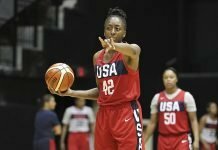 Nneka Ogwumike had 14 points and 12 rebounds for Los Angeles, while Alana Beard had 13 points. The Sparks set the tone in Game 1 Sunday, but game 2 got off to a different start for Minnesota and Moore, who was held scoreless in the Sunday’s first half. She came out firing Tuesday, scoring 12 of her 21 points in the first half and helping mount a 39-25 lead going into the break, after a 17-3 run to end the second period. 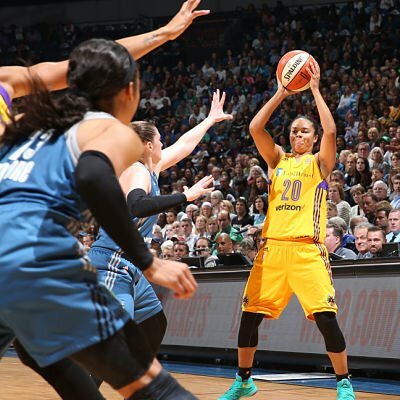 A third quarter Los Angeles run cut the host’s lead to three midway through, but Seimone Augustus ignited a Minnesota run that blew their lead back up to double digits in the fourth period. 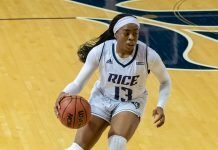 Moore, who said she had a couple of sleepless nights after the first game, described her team as resilient, and said she sought to set the tone early in Game 2. Lynx coach Cheryl Reeve gave credit to Moore and her performance. Kristi Toliver tries to get the ball past Lindsay Whalen. Photo by David Sherman/NBAE via Getty Images. Truth be told, this was not unfamiliar territory for the Lynx, who had faced an 0-1 deficit following the opening game of last year’s Finals against Indiana. During that series, Minnesota bounced back in the second game to tie it, en route to their third championship. Meanwhile, the Sparks will head into Game 3 Friday in Los Angeles looking to avoid a repeat performance of Game 2. 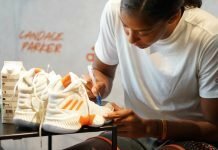 Forward Candace Parker, who Minnesota held to just six points, noted how defensive stops were hard to come by. Sue Favor co-authored this report.